A prominent aspect of the “alternative” vogue in Western countries has been that of enthusiasm for Eastern gurus and other mentors. A number of these entities transpired to exhibit complicating traits, causing disillusionment amongst their followers. Meher Baba was not one of these, his activities dating to an earlier period. The career of Meher Baba (1894-1969) evidences a clean moral record. He visited the West in the 1930s and again in the 1950s, thereafter remaining mostly in seclusion until his death. The major criticism levelled at him is that of the avataric claims he made in his later years. The word avatar signifies divine incarnation, and is derived from Hinduism. Meher Baba (Merwan Sheriar Irani) fits a rather unusual category of “guru” in that he was not a Hindu but an Irani Zoroastrian. Both his parents were émigrés from Central Iran. Meher Baba was born in India, at Pune. He was not a Parsi, as is sometimes mistakenly assumed. This ethnic complexity has made his career more interesting to me. My attitude is critical of glosses and quite independent of the devotional movement forming in his name. Pune was formerly known as Poona, then a centre of the British Raj. There, while attending the Deccan College in 1913, young Merwan Irani encountered Hazrat Babajan (d.1931), an aged female saint of Muslim birth who has Sufi associations (see Shepherd, A Sufi Matriarch, 1986). The interaction changed his life completely. In general, Meher Baba has not been favoured by “new age” adherents, who have been far more enthusiastic about Hindu gurus like Shri Aurobindo, Bhagwan Shree Rajneesh, Maharishi Mahesh Yogi, Sathya Sai Baba, and Swami Muktananda. Indeed, the Esalen Institute of California endorsed Aurobindo during the early years of their enterprise, promoting his doctrines to such an extent that these are well known by comparison with teachings of other figures. The Findhorn Foundation favoured Rajneesh and Sathya Sai Baba during the 1980s and 1990s. The Meher Baba movement has not displayed the belligerence towards outsiders that characterised the Rajneesh sect in the 1980s, a drawback more recently mirrored in the American branch of the Sathya Sai Baba sect. See further Internet Terrorist (2009). Certain developments on Wikipedia have been viewed with suspicion, implying collusion between a pseudonymous Meher Baba supporter and a militant defender of Sathya Sai Baba. See Wikipedia Anomalies: Arguments (2010). However, in general the Meher Baba movement does not appear to favour web aggression and libel. It may therefore still be possible for outsiders to comment on the figurehead without fear of hate campaign. A partisan of Meher Baba has considerately sent me notification that reference to myself appears in a recent devotee work. As such matters are now of interest to some investigators, I will accordingly cite the reference here: “Though no devotee of Meher Baba and a sharp critic of Meher Baba’s followers, Kevin Shepherd turns a critical eye on [Paul] Brunton’s account, in Meher Baba, an Iranian Liberal, pp. 146-76.” Quotation from Meher Baba’s Early Messages to the West: The 1932-1935 Western Tours, ed. W. Parks (Myrtle Beach, S.C.: Sheriar Foundation, 2009), p. 223 note 31. The editor evidently approved of my scepticism concerning Brunton, though he should perhaps have grasped that I did not criticise all the followers, as specific statements in Iranian Liberal do confirm. (Another reference to the same book of mine, and in relation to Rom Landau, occurs in Early Messages to the West, p. 224 note 32). With regard to Paul Brunton (1898-1981), there are strong doubts about the reliability of his report on Meher Baba in A Search in Secret India (1934). An obvious discrepancy has struck many readers. Brunton referred to the low and receding forehead of the Irani, which could mean that the British reporter suffered from an optical deficiency. In reality, the cranium of Meher Baba was well proportioned, and also of substantial size in relation to his body. The Irani mystic was notably averse to the caste system. He refused to sanction that problem, and instead championed the cause of the untouchables. This was a feature of his activity during the 1920s, when he established his first ashram at Meherabad (Arangaon), near Ahmednagar, a city in Maharashtra. The fact is that, after an initial resistance, he eliminated caste at his ashram, not permitting the ranking or dining protocol generally found in other Indian ashrams. Another feature that tends to distinguish the outlook of Meher Baba from other gurus is his attitude to miracles. Although in some early statements, he seems to have acknowledged the existence of “miracles,” in later years he frequently gave that subject a low rating, disowning the performance of miracles in his own case. “Many miracles have been attributed to me, but I do not perform miracles. I do not attach importance to miracles.” (Quoted in Shepherd, Investigating the Sai Baba Movement, 2005, p. 110). Meher Baba was also strongly critical of tendencies, in other followings, to create an instinct for “miracle” phenomena. In relation to Shirdi Sai Baba (d.1918) and Upasani Maharaj (d.1941), both of whom he personally encountered, he was disapproving of the hagiographical preference of devotees for miraculous events. He had been the disciple of Upasani for several years, commencing in 1915. In 1925, Meher Baba commenced silence, a discipline which he maintained until his death. He continued to communicate by means of an English alphabet board, and later a distinctive gesture language. In this manner he dictated numerous messages and discourses, and also two books on spiritual evolution, only one of which was published during his lifetime (in 1955). That contribution is unusual for an eclectic vocabulary employing Sanskrit/Marathi and Persian terms drawn from the Vedantic and Sufi traditions (the Hindu component was not exclusively Vedantic). 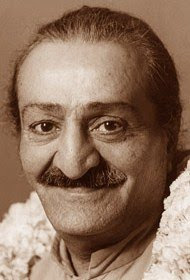 Meher Baba was fluent in Persian and Marathi, also Gujarati and English. He gained Muslim followers in addition to Zoroastrian and Hindu devotees. He was quite familiar with Sufism; however, he did not identify with that tradition, and remained non-denominational. This intercultural complexion of his teaching is another factor of difference with the Hindu gurus. Meher Baba’s evolutionism remains distinctive. His exposition incorporates reincarnation, in a rather comprehensive form which rigorously exposits a sequence of progression through the diverse species-forms until the human stage is reached. This rationale is not in any explicit opposition to Darwinian formulae, though metaphysical dimensions are pronounced. This evolutionism explains the growth in consciousness attendant upon evolution, a factor of exegesis not always found in mystical accounts. Further, there is the advantage of description in terms of impressions (sanskaras), again quite methodically elaborated. Consciousness is composed of impressions, and in this light, the reincarnation process is made more explicable. The exposition of Meher Baba differs from more well known versions of transmigration that do not clarify such complexities, and which exhibit discrepancies in terms of, for example, retrograde incarnation from human to animal. The presentation under discussion differs from traditional Vedanta in the evolutionist criteria supplied. There is also a divergence from canonical Sufism, which does not teach reincarnation. Some Muslims of earlier centuries inclined to versions of transmigration (tanasukh) associated with the Pythagorean heritage. See further Meher Baba, God Speaks: The Theme of Creation and its Purpose (New York, 1955; second edn, 1973); Meher Baba, Infinite Intelligence (Myrtle Beach, S. C., 2005); Meher Baba, Discourses (7th edn, Myrtle Beach, S.C., 1987); C. B. Purdom, The God-Man: The Life, Journeys and Work of Meher Baba (London, 1964); B. Kalchuri, Meher Prabhu: Lord Meher (20 vols, Ashville, North Carolina, 1986-2001); Shepherd, Meher Baba, an Iranian Liberal (Cambridge, 1988), with bibliography; Shepherd, Investigating the Sai Baba Movement, Part Three, “Meher Baba of Ahmednagar” (Dorchester, 2005).